There is no string lying around our yard, so we don't know where he got himself into this mess. Even more amazingly - how did he gets himself free without damaging his leg? Our first step was to explain to him and his parents Billy and Polly that we wanted to help him and they should trust us. Out came the famous possum trap that has been modified so we can safely catch birds on occasions like these when they need our help. 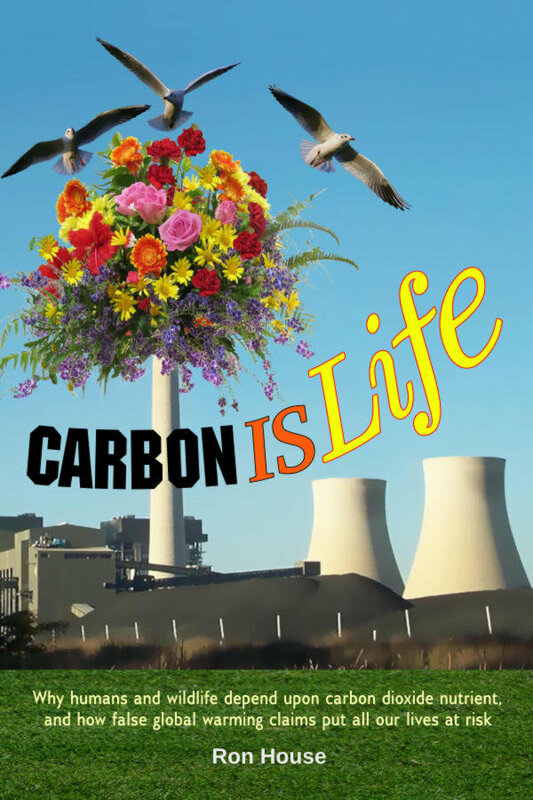 (Regular readers will remember Butchie, Maggie and Shelly's stories). Donny looked uncertain but he knew he was in a bad fix and needed our help. Billy and Polly too knew this was not something they could fix by themselves and Donny was going to be in big trouble for the rest of his life, if they did not take a chance with us. So in the typical manner that we've observed before with the other birds that we've helped, they took some time to check out the mechanism of the trap door and get used to the idea of Donny walking in. 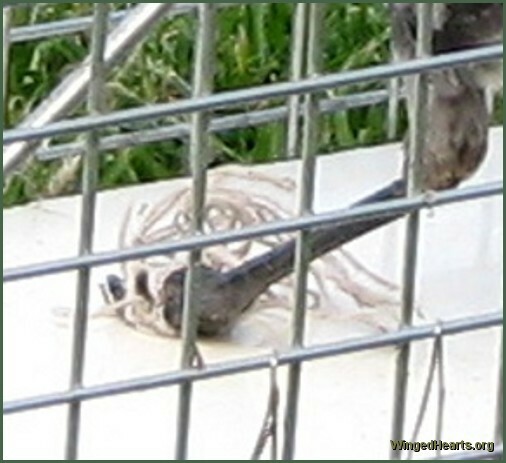 The birds fully understand that the rope attached to the trap door will be pulled shutting it once they are inside. Their friends checked out the cage while they plucked up their nerves. Donny tried entering and leaving the cage a couple of times. We had put some of their favourite cheese to entice him. (According to experts like Professor Gisela Kaplan cheese is the best way to entice magpies whenever they want to catch them.) Billy and Polly watched from a distance, then Donny walked all the way in. Ron quickly pulled the rope safely shutting the trap door. Donny did not fuss or try to escape. We brought the cage indoors, set it on a table in the bathroom and Ron set about trying to cut the string with a pair of embroidery scissors as gently and carefully as he could. He had to tugl the string a few times to get the right angle. Having his leg pulled would have been quite difficult for the young bird, but Donny did not complain or fidget even once. Donny magpie knew what we were trying to do as soon as he saw Ron cut a small piece of the string and he cooperated fully. The string was tightly wound many times over and knotted in several places around his claws, bending his back claw forward as well. The embroidery scissors were the only scissors that were fine enough to do the job. Ron took his time as he did not want to take any chances accidentally cutting or injuring Donny's leg. Donny magpie knew there was a mess of knots under his claw as well. Of his own accord he held his claw to the side of the cage so Ron could cut the string from underneath. To keep his balance he had to hold himself at the most peculiar angle. 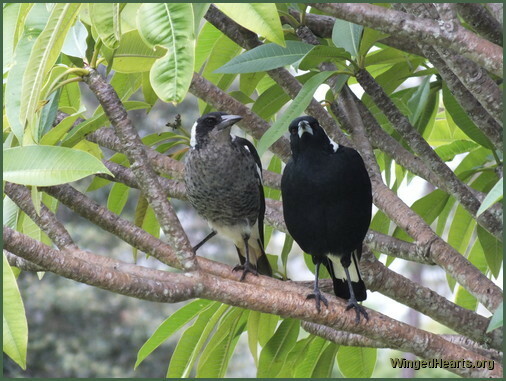 (Unlike Galahs who love dangling off trees upside down, magpies prefer to stand upright.) He is a very smart and intelligent bird. One by one each claw was freed. The whole process took one and a half hours. Not one complaint and not one squawk from Donny. 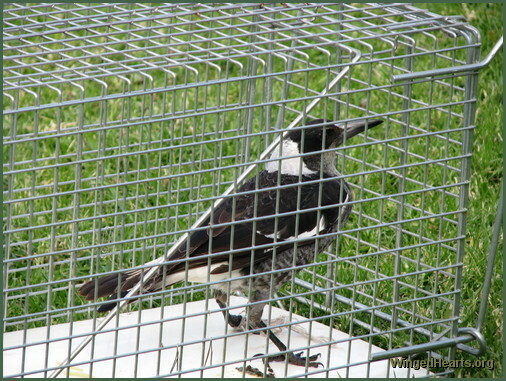 Not one move of restlessness or attempt to get away (he was not being hand held) from this highly active juvenile male magpie that could've accidentally caused the scissors to hurt him. He stood still and let Ron do the job, putting his leg in the best position he could. A remarkable bird. His parents too were very well behaved and never protested or created any agitation while we had him indoors. This is quite a feat for them considering they are all wild, have never eaten from our hands or entered our house. Once all the string was removed we took the cage out again and opened the door to let him out. His parents were not waiting nervously outside our door. It seems they trusted us completely. Donny had to fly off in search of them. Half an hour later, Donny returned with Billy, all very cute and happy to be free again. Billy looked thankful as he came closer and behaved in a much more dignified manner than usual. Donny was being more docile and body language seemed to say, "Wasn't I a good boy? I did what you told me too." This is something too that we have experienced with all of them after we catch them, fix the problem and release them. We worry that they would be put off by the experience and would avoid us, but that has never been the case - instead they always seem to say "I was a good bird, wasn't I?" 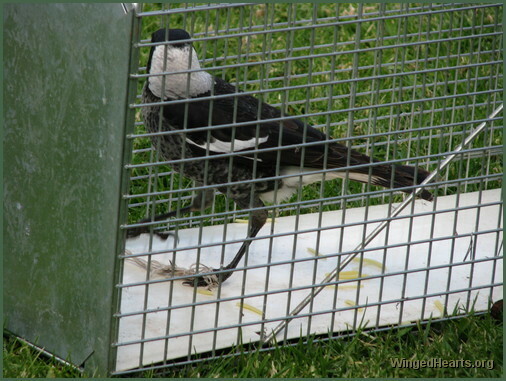 Another interesting thing that had happened - I got a vision in a meditation session that a claw of a magpie sized bird was caught badly and couldn't be released. At first I thought this was a symbolic dream of me feeling trapped about something. Try hard as I may, I could not free this claw in my vision. So I eventually asked for help from the angels and the universe. Upon which I saw some hands help free the claw. We didn't see Donny that afternoon of the vision which was unusual. The next morning, he was flying with the string around his claws. he looked quite embarrassed about his situation and baffled because there was nothing more he could do to help himself. It took another day before we could help him. Donny is much better behaved since this episode and we hope he won;t get into any more scrapes again.